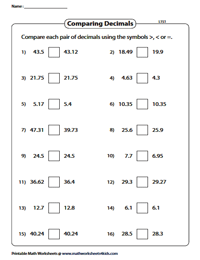 This series of decimal worksheets is based on comparing decimals using the greater than, lesser than or equal to symbols. A number of cut-and-glue activities, activities using number lines and base 10 blocks help learners to grasp the basics of comparing decimals. To enable easy downloads, the worksheets are classified into decimal values up to tenths, hundredths, thousandths and ten thousandths. 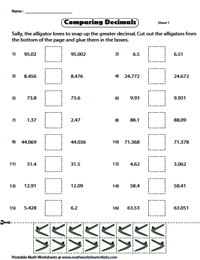 This batch of comparing worksheets is based on the popular concept "the alligator eats the bigger number". Cut out the beaks/mouths of animals that resemble < or > symbols and glue them appropriately in the boxes. 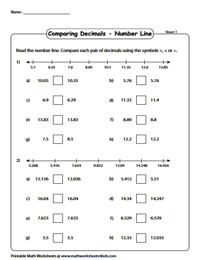 Use the number lines provided to compare each pair of decimals. Next, employ the correct symbols (<, >, =) to denote the relationship between the decimal numbers. 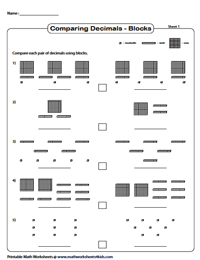 This set of worksheets uses a visual model of base 10 blocks to represent decimals. Write down the decimals represented by the blocks. Then, use appropriate symbols to compare them. 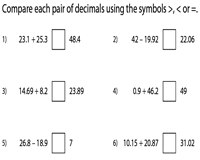 Analyze each pair of decimals. Compare them using greater than, less than or equal to symbols. Worksheets are segregated based on the place value of decimals. Add or subtract decimals on the left. Then, compare the answer with the decimal number displayed on the right. 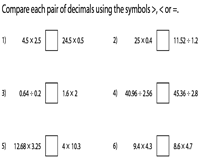 Insert the appropriate symbols (<, >, =) to complete the worksheet. This set of two-level worksheets requires students to perform addition or subtraction operations on both sides. 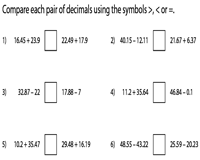 Compare the answers derived and use the precise symbol (</>/=) to denote their relationship. Multiply or divide the decimal values featured on the left. Then, compare the product or quotient with the decimal value on the right. Fill in the box with the correct symbols. Perform multiplication or division operations on both sides. Next, compare the values and fill the correct symbol in the box. Answer keys are provided below each worksheet. 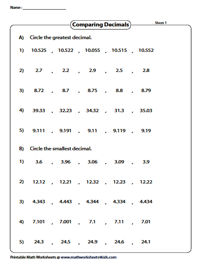 Keenly observe each series of decimals provided and circle as stated. 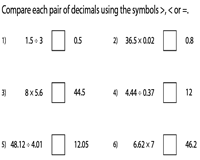 Compare the decimals to determine the greatest number in part A and smallest number in part B.